A fairly lacklustre Friday and first day of February – always a big month with domestic reporting season kicking off on Monday. Today the market opened higher, made a low around lunchtime then edged up into the close – all in all a fairly muted session which is understandable, why buy stuff today! Chinese data was again on the soft side today with the Caixin PMI (manufacturing) printing 48.3 v 49.6 forecasted. Hearing from companies with exposure into China will be very interesting this reporting season. Overall, the index closed off -1pt or -0.03% today to 5862 and was flat on the week. Dow Futures are trading up 8 points / 0.03%. Reporting; Kicks off on Monday and runs for all of February. To view a reporting calendar – CLICK HERE – I’ll be covering companies as they drop on Your Money and Channel 95 each morning, Tuesday to Friday at 9am plus, Harry, myself the team will be writing reports up on a daily basis. The afternoon report will include them. 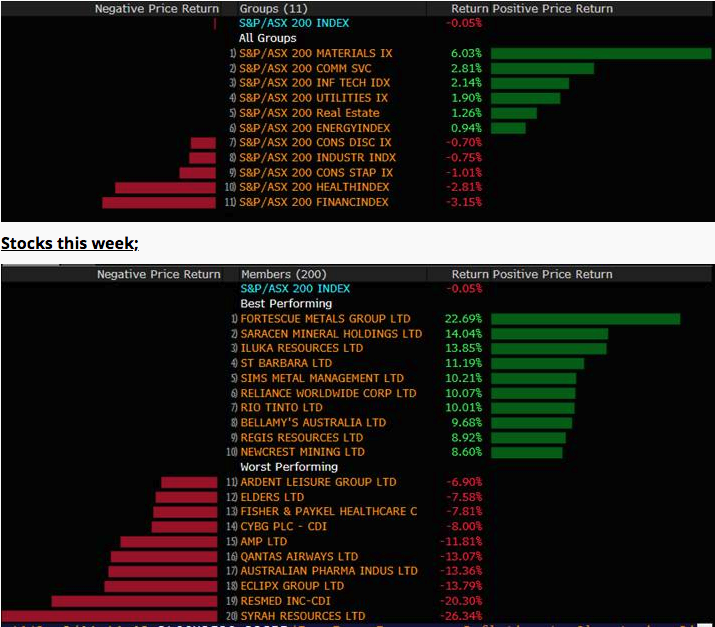 The market is negative going into this reporting period – trading on just 15.15x forward which is the cheapest forward multiple in 8 years – hardly demanding. 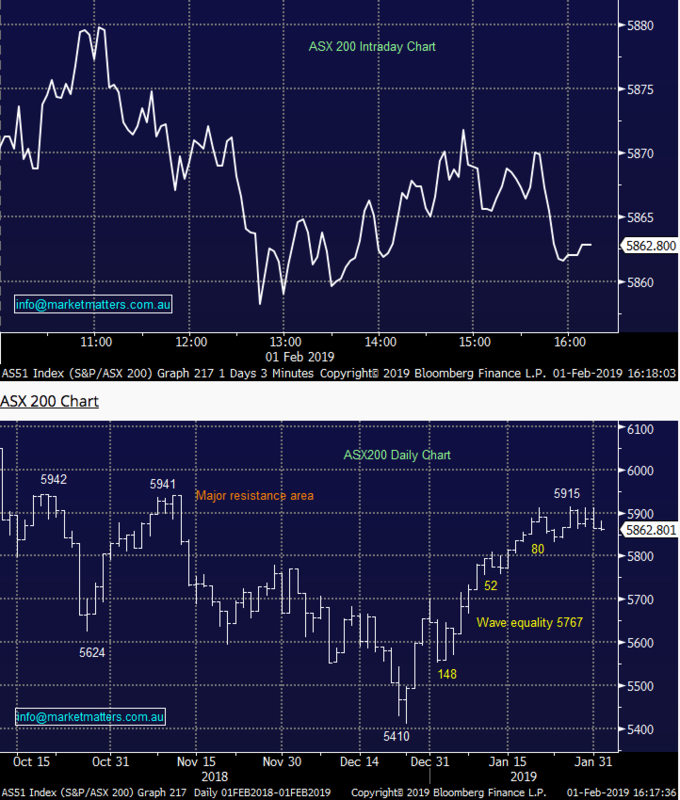 Of the companies we own, we have Janus (JHG) on Tuesday and CBA on Wednesday while NAB has a trading update on Friday. 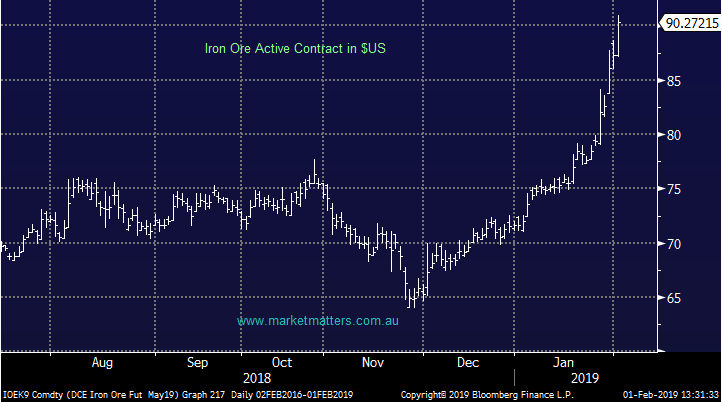 Iron Ore; Has clearly had a cracking week as the below chart shows, now we’re getting a lot of brokers upgrading their commodity price decks and that’s flowing through to increases in price targets for the miners. 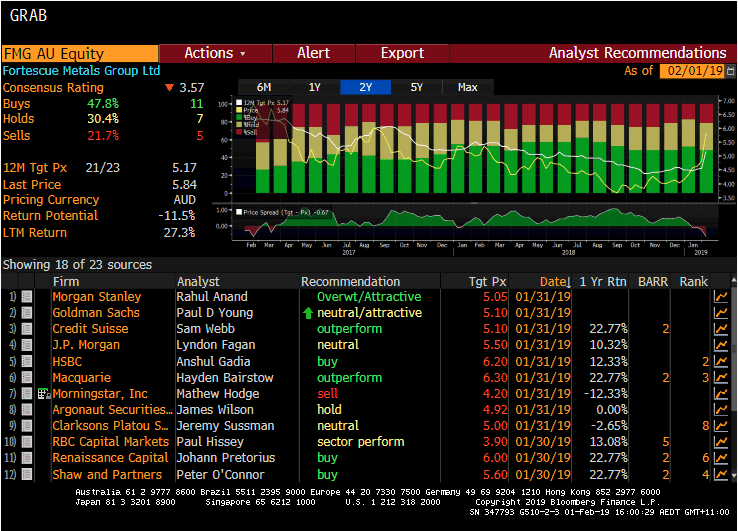 Credit Suisse had forecasted the following…$65/ton for 1Q, $61 for 2Q, $60 for 3Q and $58 for final quarter for 2019 – so clearly they’re behind the curve with the price at ~$90, as is the most of the mkt. 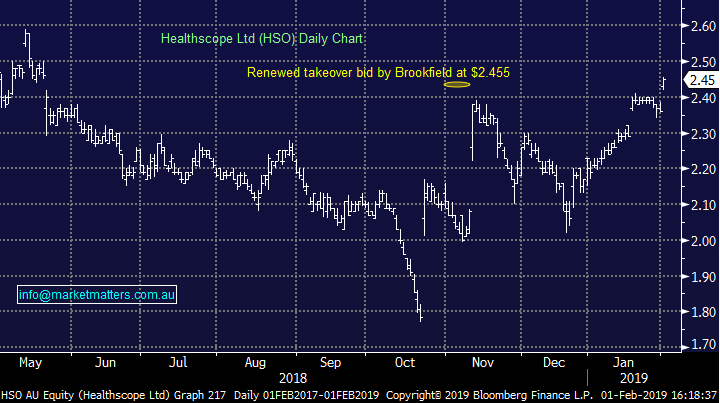 Healthscope (ASX: HSO) +3.81%; Australia’s second largest hospital operator has today confirmed another bid from Canadian based Brookfield worth around $4.5bn, or $2.50 a share. The HSO board is supporting the deal - it’s in the best interest of shareholders say the board, unanimously. Shares closed today at $2.45. There has been a rival consortium including BGH and AustralianSuper sniffing around HSO and they say they’ll pay more. They’ve already made 2 prior bids with both being rejected plus they already speak for 19.13% of the stock. I tend to think one more bid will come, or at least, AustralianSuper will talk it up further to get the best deal on their 19% holding. HSO also re-confirmed FY19 guidance today which is pleasing.